For the blueprints to a device that can transport you beyond time and space, it sure is cheap. 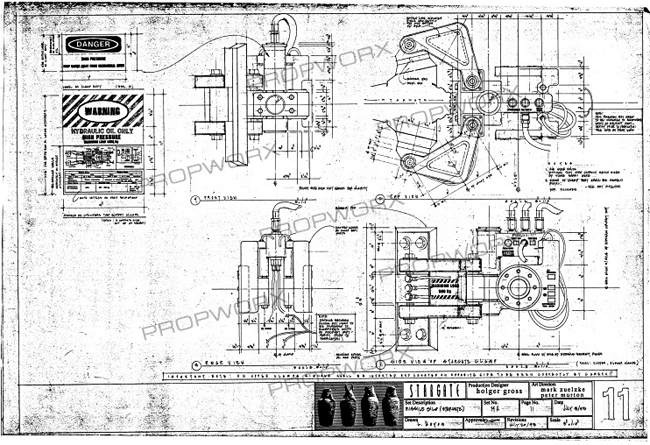 Propworx is selling the complete set of floor plans and prints on eBay for whatever reason and diehard fans shouldn’t miss the opportunity. Yes, it has occurred to us that the picture above looks like tissue scrawled with vertical lines and odd shapes. That is the blueprint for the Stargate room where a team of soldiers and some nerdy fella walked into a desert wasteland ruled by an alien overlord. Moving on, Stargate must be one of the most underrated sci fi franchises to ever hit screens both big and small. This doesn’t mean it’s incapable of making an impact on pop culture. For the factoid hungry geeks out there, progressive rock guitarist/connoisseur Arjen Anthony Lucassen actually wrote a song about the Stargate movie titled “The Eye of Ra” for his 2001 album Space Metal. Concept albums and brlueprints aside, if you’re interested in acquiring a few sheets of great historical value, then go here for the purchase.